12th November, 2009 – estatecreate won The innovation Award last night at an awards ceremony organised by The Negotiator magazine in association with The Digital Property Group. estatecreate was founded by Henry Yates and is the first company to offer this service to estate agents in the UK. Yates is an experienced entrepreneur who has previously co-founded and sold two businesses, Face, the research and planning agency (www.facegroup.co.uk, sold to Cello PLC) and Univillage.com, the social network for students (sold to www.sub.tv). estatecreate has announced a new partnership with The Live Organisation, the UK’s leading provider of residential conveyancing, with the launch of Live Sitemaker software which allows agents to create individual websites for their properties. The Live Sitemaker software allows clients to create an individual website for each property and a personal domain name. The format is easy to read and understand, allowing customers to view the property information with no confusion. Clients have more online space to include information about the local area, schools and contact details, as well as substantial room for photographs. The easy to use software only takes minutes to create and publish websites. Clients can share the personal property websites through social networks and get more leads from other agents. The personal domain name is more memorable, making it more effective for advertising purposes. The websites can be branded for users, making them more visually appealing. There is no duplicated entries as the software auto-populates the sites for you. Tim Price added: “Individual property websites are innovative and functional. More details of Live’s new service can be found at www.live-sitemaker.com. 4th FEBRUARY, 2010 – estatecreate has launched a new service for estate agents that will drive more web traffic to their properties from search engines. Search Engines such as Google are putting more and more emphasis on website content and domain names. By using estatecreate websites to showcase properties on key street names in an agency’s neighbourhood, agents will increase their search traffic and drive more leads to their properties. The service is very easy to set up. First an agent needs to identify key roads where they sell houses in their neighbourhood. estatecreate is a new tool for estate agents to showcase a vendor’s home with a standalone website for their property with its own domain name. The service is very easy to use – estatecreate takes a feed of data from each branch and the agent can then easily add content and publish to a domain name of their choice. The service is the holder of The Negotiator’s Innovation Award and the Web Marketing Association’s WebAward. 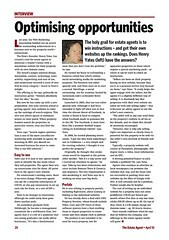 The Estate Agent interviewed estatecreate in their April issue. Unfortunately it is print only, so here is a screenshot. The future of property search? How much time do you waste clicking on a link to a property only to see that the photos show somewhere completely unsuitable. How would you like to drag a stream of photos of images of properties in the price range and area where you live to quickly zoom in on something you like? Sorry to get you all excited, but this site does not exist. But it could. I have just been playing with Cooliris. As they put it themselves, “Cooliris transforms your browser into a lightning fast, cinematic way to discover the web”. I was not disappointed. Somone will adapt this for browsing properties – it’s going to be great. Will Heathrow expansion plans have an effect on London property prices? This morning it looks like the extension to Heathrow will go ahead. The economic argument has won over the potential environmental impact. Hardly surprising in the current economic climate. However, have Londoners fully appreciated the potential effect this will have on the capital? The biggest direct impact on London will be noise pollution. If you have been down to Kew gardens recently you will have noticed that the times that the flight path is in a Easterly direction it is not a very relaxing place to hang out. Planes fly over at what seems like one/minute. • To the west, the flight path is likely to be over Maidenhead and Slough. The ending of runway alternation – where planes landing over West London switch runways at 3pm – will take away the valued half day’s peace and quiet enjoyed by residents in these areas. This will include removing the half day’s peace and quiet at the National Trust’s property in Osterley. So, by 2015, there could be large parts of West London directly under the new flight path. Holland Park may not be quite the peaceful place it is today.